Indeed, it seems difficult to imagine that Serbia will not have a more intimate relationship in the next four years with Russia: Nikolić will travel to Moscow next week to attend the United Russia congress and to meet with newly inaugurated Russian president Vladimir Putin, a sign that’s already being seen as a rare diplomatic coup for Russia. Over a decade that has seen former Baltic soviet republics join NATO, EU flags flying across Georgia in the Caucasus, and any number of “color” revolutions from Ukraine to Kyrgyzstan demanding greater democracy, Nikolić’s election is a rare high point for Russia — for once, a country’s foreign policy will now look more to the east than before (if just slightly). Although the recent elections and presidential runoff focused on the bread-and-butter economic issues of unemployment, the fall of the dinar, and inflation — Nikolić finally won the Serbian presidency and won the largest share of the Serbian parliament for his center-right party, the Serbian Progressive Party (Српска напредна странка / SNS) on the basis of economic frustration — the “normal” cadence of the election cannot hide the ghosts of Serbia’s very recent past in ways that may give rise to some caution throughout Europe over Nikolić’s presidency. Nikolić served as deputy prime minister from 1999 to 2000 under Slobodan Milošević, while thousands of ethnic Albanians in Kosovo were being persecuted and while NATO led a bombing campaign against Belgrade. To be fair, the ghosts of the 1990s haunt the entire Serbian political scene. For example, notwithstanding Tadić’s very pro-Western and pro-European stance, his party is likely to end up governing only with the support of the third-place leftist/nationalist Socialist Party of Serbia (Социјалистичка партија Србије / SPS). Although its current leader, Ivica Dačić, has also taken steps to make painfully clear his support for Serbia’s integration into Europe, the SPS was founded by Milošević himself in the 1990s. If the East-West balance might skew more toward Russia in a Nikolić presidency, the question of Kosovo is even thornier. 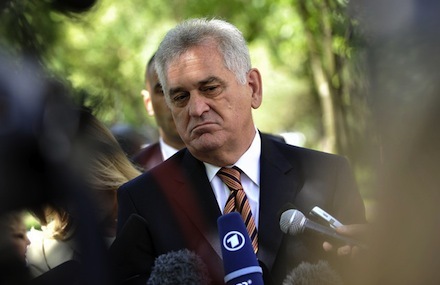 Serbia has still not recognized the one-time breakaway province, although Tadić had taken a mellow approach, to say the least, in prosecuting Serbian claims to Kosovo since its declaration of independence. Kosovo’s sovereignty is pointedly recognized by the United States and virtually all of the European Union*, but not by Russia or China (who have, in turn, held up UN recognition). It’s clear that Pristina is not exactly enthralled with a Nikolić presidency — the hope that Serbia will formally recognize Kosovo is an even more fanciful possibility now, and it may well be that a Nikolić-led Serbia may try to repatriate a small part of northern Kosovo, in which Serbs still form a majority of the population. Nikolić did not make Kosovo an issue in his campaign and although he is not expected to pursue a divergent policy on Kosovo immediately, he made a point of recognizing northern Kosovar Serbs and said in his victory speech that the election showed Serbia would protect Serbs in northern Kosovo. Indeed, under a deal brokered by the Organization for Security and Cooperation in Europe, ethnic Serbs in Kosovo even voted in the May 6 elections and the May 20 runoff — nearly 109,000 Kosovar Serbs voted in the presidential runoff. * Spain is the only major EU country not to recognize Kosovo’s sovereignty — it doesn’t take much to realize why Spain, with its strong regions and historical difficulties not only in the Basque Country, but in Catalonia and elsewhere, might not be too enthusiastic about doing so.